The default keyboard on your iPhone has the classic QWERTY format that you may have learned in high school typing class. If you write in a language other than English, however, you’ll want to add a keyboard that reflects the language you want to type in — and recognizes words in that preferred language. You’ll get crazy suggestions if you type in Swedish with an English keyboard and dictionary. You also have some other optional keyboard functions that you activate, or deactivate, in Settings. The screen shown here opens. Tap the toggle switch to turn the following functions on or off. Auto-Capitalization: Automatically capitalizes the letter “I” when it stands alone and capitalizes the first letter after any punctuation that iPhone recognizes as a new sentence, for example a period or a return. If you use Emoji, this function also capitalizes the first letter after you insert a smiley face, heart, or one of the other myriad icons. 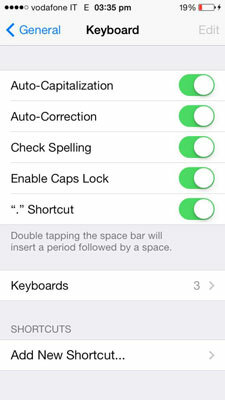 Auto-Correction: Automatically corrects words as you are typing using iPhone’s built-in dictionary. 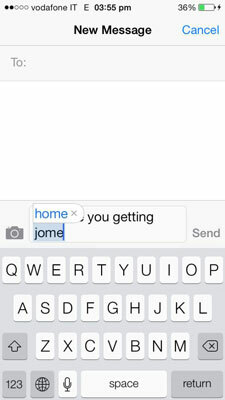 For example, if you type jome, “home” appears in a box above the word. If you tap the space bar, the return key, or a punctuation key, the suggestion is accepted; tap the X on the box, or just keep typing to complete your word, and your typed word remains. The dictionary automatically adds names from Contacts so it recognizes many names you type. Your iPhone learns your idiosyncrasies, adding words you type frequently, that it doesn’t know, to the dictionary. Check Spelling: iPhone underlines words it thinks are spelled wrong. Tap the underlined word and iPhone shows you possible replacement words. Tap the one you want or tap elsewhere on the screen to decline. If iPhone thinks the word is spelled wrong but doesn’t have a suggestion, a flag reads No Replacement Found and you have to correct the word, if necessary, on your own. Enable Caps Lock: When this is on, you can quickly tap twice on the shift key and it changes to a caps lock key. “.” Shortcut: Double-tapping the space bar inserts a period and then one space. To change the keyboard layout, tap Keyboards. Tap English or whichever language’s keyboard you wish to edit. Most languages have optional keyboard layouts. The screen opens and displays options for the Software Keyboard Layout, that is the keyboard on your iPhone, and for a Hardware Keyboard Layout, which is a peripheral keyboard that you use with your iPhone. You can choose the Software Keyboard Layout you’re used to using. Choose the Hardware Keyboard Layout that corresponds to the type of peripheral keyboard you use with your iPhone. Swipe right or tap Keyboards in the upper left to return to the Keyboards settings. 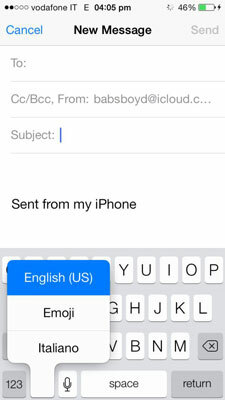 Tap Add New Keyboard to add another language-specific keyboard. A list of languages opens. Many languages have multiple options, such as the Chinese handwriting option or the Swiss or Canadian French option. Tap the language you want to add. It automatically appears in the list of keyboards. Repeat Steps 7 and 8 to add other languages or tap Keyboard in the upper left to return to the Keyboard settings. To delete a language, tap Edit, and then tap the red and white minus sign to the left of the language. Tap the Delete button that appears. To rearrange the order of the languages, touch and drag the rearrange button (it looks like three stacked horizontal lines) to move the languages to the order you want. Shortcuts let you type a few letters that your iPhone interprets and expands into a longer phrase. For example, type omw in a message and it becomes “On my way!” Type your text in the Phrase and Shortcut text fields and then tap Save. If you add a word or phrase to Shortcuts without typing in the shortcut, the word or phrase is added to your Personal Dictionary and iPhone won’t make suggestions for correcting it. Tap Keyboard in the upper left, General in the upper left, and then Settings in the upper left to return to the main Settings screen, or swipe right until you reach the screen you want.